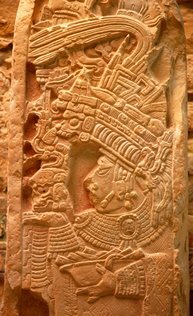 1300 years ago in the forests of Guatemala and the Yucatan Peninsula, the ancient Mayan Culture was at its height. Over 60 independent kingdoms or 'city-states' (the correct term is a point of discussion among mayanists) ruled over a vast territory and interacted in commerce and trade but also in cosmic warfare and ritual bloodshed. Then abruptly around 800 AD, they vanished and left their cities prey to the rainforest. What happened to them? What was it exactly that collapsed and made them go away? The problem with the Ancient Mayan culture is that like after a plane crash, the bits and pieces lie scattered around. In the event of a plane crash, though, technicians can use the blueprints of the original airplane to restructure what's left. That way and with the plane's black box hopefully they will be able to determine exactly where things went wrong. With the Maya we do not have access to their 'blueprint' and re-assembling Maya society exactly as it was might turn out to be impossible. Slowly however and with lots of patience and human effort, the bits and pieces are put together again. They give us a fascinating insight in this enigmatic civilization. The Maya are considered to be one of only a few urbanized societies in rainforest areas where poor soil conditions and erosion make agriculture barely sustainable. That and the fact that they had no technology whatsoever make it even more remarkable that Mayan culture reached a high intellectual and artistic level by the 7th century, AD. Before the Maya came into existence, there were other groups. The Olmecs on Mexico's Gulf Coast already venerated the Jaguar has a symbol of masculinity and of the nightly Sun. As far back as 1500 BC they built monumental platforms to worship their ancestors. Archaeologists have identified a rudimentary glyph system for writing and Olmec influence is recognized throughout Mayan history and art. From the Zapotecs in southern Mexico the Maya may have absorbed the 365-day solar calendar and the 260-day moon calendar, so this is not necessarily the merit of the Maya. Then what makes them so special? The Maya went on to use a linear accumulation of days, from 3114 AC onwards. It was only until NASA began to count seconds from 1950 onwards that the Maya calendar lost its position as the most precise registration of time in existance. They only needed to correct their counts by a day once every 5,000 years. Compare that to our need to make up for a whole day every 4 years! By 600 AD they were able to transform any idea or concept into the only complete writing system in the Americas. Language is another important reason why the ancient Mayan culture qualifies as a civilization in its own right. Today, 28 Mayan languages coming from the same Proto-Mayan root are still spoken in Guatemala, Honduras, El Salvador, Belize and the Southeastern states of Mexico. This more or less defines the area where they built their ceremonial centers with temples and palaces. 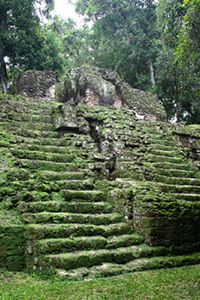 Today it is in the area around Copan (Honduras) where the spoken language comes closest to that of the ancient Maya. Evidence of early human settlement goes back to 2,000 BC. Farmers' villages popped up everywhere and from the earliest settlements in southern Guatemala people started to spread out over the hills of the Peten jungle and the plains of Northern Yucatan. Efficiency in the production of food meant that some people were now free to spend their time on other activities and to 'specialize' . The appearance and use of simple ceramic pottery for daily use is crucial in this so-called Pre-Classic period. People live in large family groups in thatched huts. No doubt some persons have an innate talent for healing, diplomacy, and helping other people fix their marital problems. Today they would be a doctor, attorney or psychologist. In early societies they were the shamans. Between 250 and 900 AD Mayan culture reached its maximum splendor. This period is known as the Classic Period. The Classic is when the socio-economical development and stratification permits small groups to gain control over a multitude of communities for the benefit of a few specialized minorities in the city-centers. In other words: there is a small elite that parasites on a large mass of people. This is truly the 'golden age' of Mayan culture, with many independant kingdoms like Copan, Palenque, Dos Pilas, Yaxchilan, Coba and of course the 'superpowers' Tikal and Calakmul. These two are like Washington and Moskou during the cold war, they certainly clashed several times and may have taken part in the onset of overall crisis in the 8th century, AD. From about 700 AD onwards Classic Maya society began to disintegrate. Theret were probably a number of factors involved, but it is generally accepted now that in some areas periods of drought along with erosion played a major part. The Maya used slash-and-burn (swidden) agriculture. They were constantly burning down vegetation to plant their crops. It is an important fact that even during the heydays of Ancient Mayen culture most people were simple farmers who were necessary to feed everyone. The percentage of farmers is estimated to be as high as 80 or 85 % of the total popultation. A Maya farmer could probably feed is own family and one more, whereas an Egyptian farmer living along the fertile Nile delta could easily feed five to seven families. This makes a huge difference! Next, they covered their monumental buildings with stucco. To make this stucco they burned the limestone. Calculations have shown that to prepare one bucketful of plaster they needed six buckets of wood. So just like the people on Easter Island did, they practically chopped down all the trees on the Yucatan Peninsula and ended up causing heavy erosion of the subsoil. Drought may have contributed to the general crisis. In early days when there were not many people around humans could recuperate from drought more easily. Around 800 AD however, there were already too many Maya who all needed to eat. Maybe they shortened the time to leave the field swidden, resulting in decreased crop yield which in turn only added to their problems. Now ask yourself: what was the source of their subsistence? The Gods, of course! So when a Maya king couldn't make it rain anymore, he definitely had a problem. This may not be the only factor involved, but possibly the ideology of the Divine Ruler was undermined by this time. People just stopped believing in the system. Kings were eliminated and people started to move away. By AD 900 most Classic era city-states were abandoned. Vegetation had already started to cover up the temples and palaces. The Northern lowlands of the Yucatan Peninsula however are an exception. Various groups of immigrants like the Itzaes and the Xiues penetrated the region, taking over trade-routes and carrying an innovative spirit. The Puuc-style buildings in Western Yucatan are a beautiful example of this so-called Mayan Baroque. The Nunnery at Uxmal is considered to be one of the most harmonious buildings of Mayan architecture. Be sure to see it when you visit Yucatan. Towards the end of the 10th century AD, there's another new development: Toltec mercenaries coming from Central Mexico along with Putun groups from the south took over and merged into a hybrid culture known as Maya-Toltec. This period is best known for the temple of Kukulkan at Chichen Itza as its masterpiece. The Itza dominated most of central-east Yucatan during the 11th and 12th century, until somewhere between 1185 and 1204 civil war put an end to its hegemony and the Itza were expelled from the area, marking the end of the Early Post-Classic period. Late Postclassic is marked by the dominance of Mayapan over West-Yucatan until the city was plundered and destroyed in 1441, probably by its own people. At the same time trade posts flourished along the Caribbean coast. 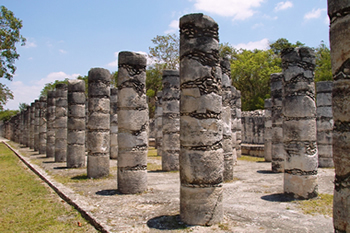 The island of Cozumel was turned into a major marketplace and a place of worship to the Moon Goddess, Ixchel. Starting point from the mainland for the cross-over to the island was a place called Xaman-Ha (the northern beaches), now Playa del Carmen. These trade posts or 'ports' include El Meco (Cancun), Pole (now known as theme-park Xcaret), Paamul, Xel-Ha, Muyil and of course, Tulum, originally called Zama. Zama was also the first place described in Spanish ships' journals. Its white plastered buildings made them remember their homes in Andalusian Spain, so they compared it to their home-port, the city of Seville. Incidentally you should know that these time-limits I mention are case-sensitive. 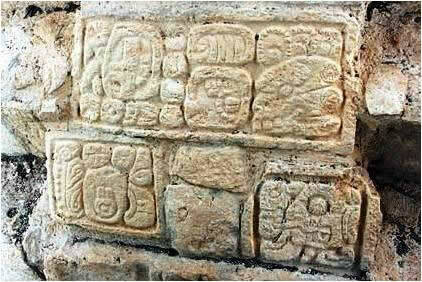 Not all periods are necessarily found in all Maya cities or in some cases there maybe interruptions of continuity. El Mirador in Guatemala was a huge late pre-classic kingdom already abandoned and in ruins when the ancient Mayan culture started to transform into its highest splendor. Ek Balam is late Classic and had only a short lifespan, whereas at Coba we'll find all three periods of occupancy. Oh, and in case you've seen Mel Gibson's film, Apocalypto, well, he comprised all periods into a nice (and provocative) Hollywood movie, starting with hunters from pre-historic times, bringing them together with 7th century Maya kings. At the end of the movie the main character is suddenly transported into the 16th century at Tulum beach where he's totally dumbstruck by the arrival of strangers in weird outfits. The Ancient Mayan culture in a (Hollywood-) nutshell!